Graduation – Class of 2014! I’m officially a graduate!! On Friday it was finally my turn to graduate and it was the culmination of 3 amazing years of hard work (and a lot of partying)!! I am so thankful for the whole experience, I have met some amazing people along the way both in Southampton and Finland and it’s sad to think that this is the end of an era but it’s also time for the next chapter in my life. I honestly couldn’t be more proud of myself, many of you probably don’t know but I was really poorly during my final year and there was a few moments when I didn’t think it would be possible to finish. But here I am, I persevered and it was without a day one of the best days of my life! My ceremony wasn’t until 2:30pm but there was lots to do before then. I headed to the Benefit counter in Boots first and had my makeup done in the morning which I absolutely loved and it lasted all day! The downside was that it was raining all morning so getting more pictures beforehand was out of the question, luckily it cleared up by the afternoon, god definitely answered my prayers, thankful that I wasn’t wearing fake tan either! I didn’t manage to get any pictures with all of my family together as we had SO much to carry because of the rain. We had a group photo beforehand though which I really can’t wait to see! Before the ceremony I caught up with one of my best friends from uni, we met whilst studying in Finland and I don’t think I would have survived the year without her! It’s sad that I don’t know when I will see my friends next but it’s a good reason for touring the country by car! I think take 3 kinda worked?! Had to do the obligatory throwing the hat photo! Once the ceremony was over we lost half of our course friends so we had our own mini procession. So that was the end of the most amazing day that I could have wished for. Everything was so perfect and it was amazing to see all of my friends again. I was more than happy to take my robes, hat and heels off after wearing them all day. My shoulders genuinely have burns on them from continuously having to pull my robes back up, ouch! After the ceremony we headed into a marquee for drinks and biscuits! This made me much happier than it should have done, shortbread biscuits with the Southampton Solent sign on what could be better?! 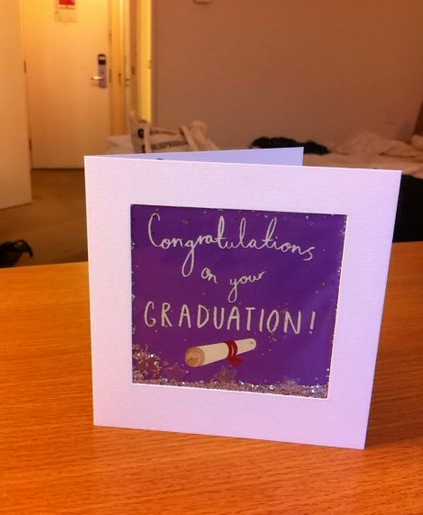 I hope you enjoyed having a peek into my graduation! Also apologies for the lack of posts this week sometimes life gets so hectic that it has to be put on hold but I’m full steam ahead again from this week, so look out for some more beauty posts this week! Hope you all have a lovely weekend! Previous Post #SotonMeetup Southampton Bloggers meet up! Next Post Christmas Homeware Haul!